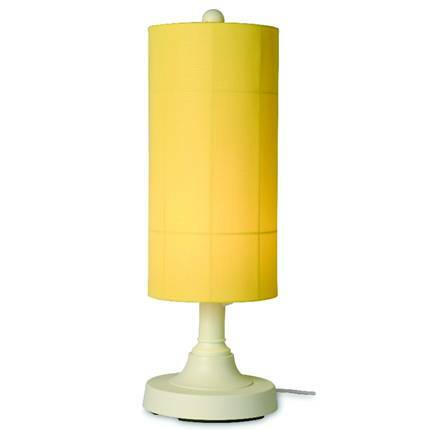 The Coronado Patio Resin Table Lamp features all weatherproof, resin construction and comes with a Sunbrella Cylinder Lampshade in your choice of fabric color or design. A two level dimmer switch allows you to control just how much light you need. All components are weatherproof. Cord for the table lamp is 16 feet. An unbreakable, poly- carbonate, waterproof, light bulb enclosure allows for the use of a standard 100 watt bulb. Each base lamp is available in your choice of white, bisque or bronze, while the Sunbrella lamp shade is available in a variety of Sunbrella fabrics. . Since these lamps are designed for outdoor use, you will find these lamps are functional as well as decorative for your porch or deck area. You will love the added touch of elegance that a The Coronado Collection will bring to your patio or deck area. They are sturdy and will last for years. Mix or Match or buy all three. Nothing is more practical for lighting up an outdoor area for entertaining your friends after dark. Lamps are 30 " tall. Lampshades are 20-1/2" tall by 10" in diameter. Has a 16ft electrical cord. Waterproof enclosure allows use of standard 100 watt light bulb.